One of those care workers is Rosa Ernesto, who has been caring for vulnerable children and patients in Gondola with Rubatano HBC since 2003. When she began volunteering, she had just lost a husband and was alone with 5 children. Though she had hardship in her own life, she says she knew she was being called to serve others poorer than herself. “I had the strong feeling in my heart that this is God’s plan for me,” Rosa says. It was also part of God’s plan for Germena’s family. “We thank God for the people who came and are helping us,” Gertrude says. 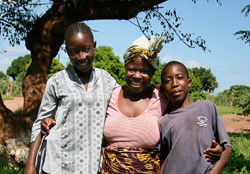 “My mother is much happier now because a big burden was lifted off her shoulders.” Gertrude now attends Grade 7.